METHAM SODIUM is a soil fumigant that is classified as a carbamate. it is composed of Sodium Methyl Dithiocarbamate 51% as the active ingredient which is effective in controlling the soil borne pathogens. 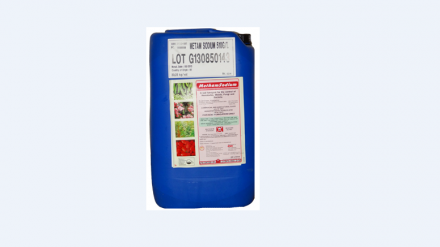 it has no crop range and can be used on fields to be planted with any crop including ornamentals, pineapples, strawberries, nurseries, tomatoes, potatoes, beans, pyrethrum etc.RATE AND MODE OF APPLICATION: First wet the surface slightly and then apply the recommended rate of Metham Sodium 51 (diluted in water 1:2) evenly over the area with an appropriate sprayer (knapsack, tractor etc). Thereafter, irrigate to saturation and cover with polythene to ensure better gas penetration to the soil. Leave soil undisturbed for 3 (three) weeks. Loosen the soil to allow excess gas to escape and then plant. If temperatures remain below 160C during the waiting period, it may be necessary to extend this period to four (4) weeks. In any case, it is advisable to test the presence of residue gas one week before planting with radish or lettuce seeds. Furrow application: Dilute the recommended dosage in water to obtain a homogenous mix to fill the furrow. Level the field to cover the furrows and then irrigate to saturation. Sprinkler application: First lightly irrigate the field with water and allow 4 days then follow with water containing the recommended dosage of Metham Sodium through fertilizing tank. Finally, irrigate with water to saturation. Drip irrigation method: First inject water to wet the application area. Then introduce the recommended dosage of Metham Sodium into the fertilizer tank, add water and generously irrigate. Covering the treated surface with impermeable polythene sheeting ensures better retention of the active gas thus better results. CONTRADICTIONS: Do not mix with any other pesticide or fertilizer. Apply at a distance of one metre from growing plants to avoid phytotoxicity on the plants. The tanks and outlets should not be made of Cu, Bronze or Zn because Metham Sodium is corrosive to those materials. Iron and stainless steel are recommended. PRECAUTION: The product is toxic to fish and most organisms – being a fumigant. Wear protective clothing when handling it as per label recommendations. STORAGE: Store in cool, dry store, in tightly closed original containers, away from food stuffs, feeds, children and livestock.